The mesothelioma law firm of Kazan, McClain, Satterley & Greenwood, A Professional Law Corporation (Kazan Law) was founded in 1974. 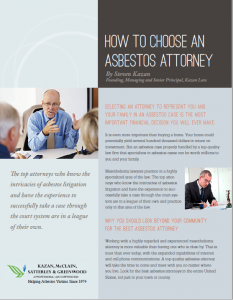 As pioneers in asbestos litigation, the mesothelioma lawyers at Kazan Law have represented clients across the United States, and in Canada, Mexico and the United Kingdom. Kazan Law’s practice is limited to cases involving catastrophic injury and death from exposure to asbestos. Our 25 California mesothelioma attorneys and more than 40 support staff are dedicated to obtaining justice and peace of mind for asbestos exposure victims and their families. Kazan Law attorneys have been instrumental in winning precedent-setting rulings by the California Appellate and Supreme Courts. All of the principals and many of the associates have extensive trial experience. Over the last 38 years, Kazan Law mesothelioma lawyers have won many landmark cases and achieved many large settlements from asbestos manufacturers, distributors, contractors, premises owners, and the insurance companies who represent them. Service on the creditors’ committees for asbestos disease victims in the reorganizations or bankruptcies of asbestos companies that sought to avoid their responsibility under the bankruptcy laws, examples of which include: Babcock & Wilcox, Combustion Engineering, and Owens-Corning. Service on the Trustee Advisory Committees for Asbestos Bankruptcy Trusts established in the above cases through the reorganization processes. Membership on the Plaintiffs’ Steering Committee for Asbestos Multi-District Litigation (MDL) for cases filed in Federal Courts throughout the United States. Membership on numerous asbestos victim compensation trust advisory committees. Testifying before the U.S. Congress, expressing concerns of victims and putting forth recommendation on asbestos litigation for the American Bar Association. Frequently being featured at asbestos litigation conferences around the world, and a much sought after subject matter experts by the legal and general press. Click here [needs link] to obtain more information about some of the firm’s significant trial verdicts and appellate decisions.